Lord, lady could you please just make up your mind or do us all a favor and stop making statements. This is the primary reason why I knew I couldn't have a gossip website because this is just too much work. You don't know what to believe. 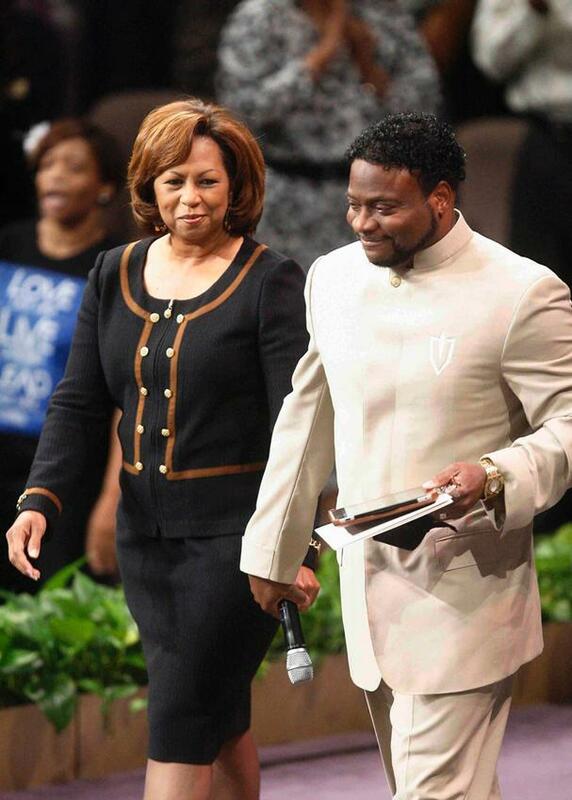 Well, it looks like the divorce is back on for Bishop Eddie Long and his wife of 21 years, Vanessa. After what can only be described as a bizarre couple of days, Vanessa has decided to stick to her guns and seek a divorce. The reconciliation of Vanessa and Eddie Long didn't make it through the day, as the wife of the charismatic New Birth Missionary Baptist pastor has decided against withdrawing her petition for divorce filed late Thursday afternoon. "Mrs. Long continues to hope that this matter may be resolved expeditiously, harmoniously and fairly; however, she has determined that dismissal of her divorce petition is not appropriate at this time," Kilpatrick Townsend partner Michael W. Tyler said in a prepared statement. "To avoid any undue confusion, Mrs. Long's future statements, if any, will be issued through her attorneys," he said. A spokesman for Kilpatrick Townsend refused further comment. Vanessa Long released three statements to the media Friday. First she announced she was seeking to end her 21-year-marriage following "a great deal of deliberation and prayer." Then, around lunchtime, in a statement sent through New Birth's public relations firm, Vanessa Long said, upon further "prayerful reflection," she was withdrawing the divorce petition. "I love my husband," she said in the second press release. "I believe in him and admire his strength and courage." Long, a New Birth elder, said her decision to seek a divorce was driven by "years of attacks in the media that frustrated and overwhelmed me." She and her husband "mutually agreed to find healing," Vanessa Long said. Six hours later, her attorneys announced she was proceeding with the divorce "consistent with her original [statement] made this morning." In the divorce filing, Vanessa Long, 53, said her marriage to the New Birth pastor was "irretrievably broken" and there was "no hope of reconciliation." The couple has been in a "state of separation," according to the petition. "Vanessa is, and has always been, a loving, dedicated and committed wife and mother," Bishop Long said in a statement Friday night. "My love for her is deep and unwavering. It remains our sincere desire to continue working together in seeking God’s will in these circumstances." This is HER marriage that she is ending. She should take as much time as she wants to come to a final decision. She can go back/forth as many times as her heart desires. Who knows how many times people change their minds in processing their emotions to make decisions like this. It truly is a sad situation.